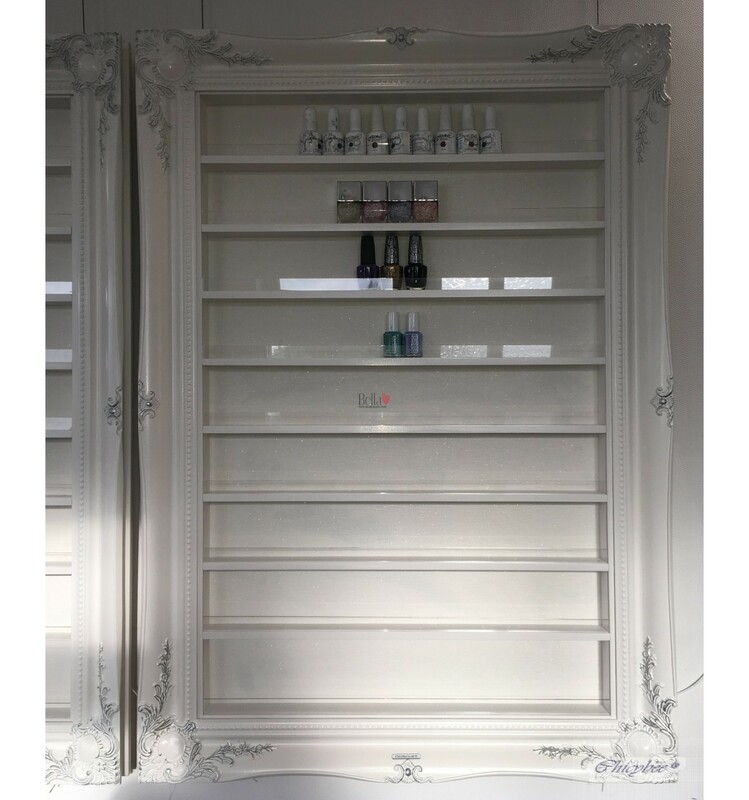 WHITE BAROQUE NAIL POLISH DISPLAY, STORAGE CABINET WITH GOLD LEAF DETAIL IF YOU LIKE A LITTLE GLAMOUR..THIS LITTLE BEAUTY CERTAINLY HAS IT ... THIS STYLISH CASE HAS BEEN HAND PAINTED IN WHITE AND HAS A SIMPLE CLEAN LOOK TO IT. 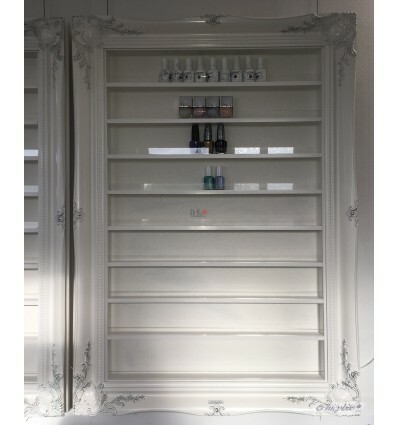 Glossy White Nail Polish Rack French Baroque Style ....A stylish and unique storage solution for ALL that polish handmade to order. This stunning display frame is just beautiful to look at, the frame is a lovely satin white Baroque style with white gloss shelves and a gorgeous white sparkle wallpaper. This size will hold around 150 bottles (depending on brand used could be more or less). I . The frame has the added feature of an acrylic safety lip - not crucial but quite often preferable - to ensure your customers do not knock any bottles off.The whole look is finished off with some real gold leaf applied to the ornate corners which highlight the intricate detailing and makes this style look very elegant. This beautiful and stunning frame will provide a real focal point in your salon to draw attention to your products - enticing customer to purchase your retail goods perhaps? They are fitted with a longer length cord too to enable you to easily reach your wall sockets. The remote control function is a really cool way to create an ambient atmosphere and as they are low cost and energy safe LEDs can safely be left on overnight to draw attention through your windows to your display. Pease bear in mind these are all hand made display cabinets and as such are made to order. The lead time is normally up to 4 weeks but if we have one already in stock then it will be dispatched sooner. If you have a new salon opening or a launch date to meet then we can often accommodate this so please do ask. Delivery is always trackable and a next day service post completion and we are also able to offer weekend delivery for an extra cost.